Is it possible to work full-time and still earn huge money doing wholesaling on the side? For a dedicated and passionate wholesaler like Alfredo Elias it is. And he has a $69,000 cheque to prove it! While only 27, Alfredo has achieved something really impressive—work full-time in the military and build his wholesaling business at the same time. After looking for passive income opportunities, Alfredo discovered real estate (and eventually wholesaling) and fell in love with it. 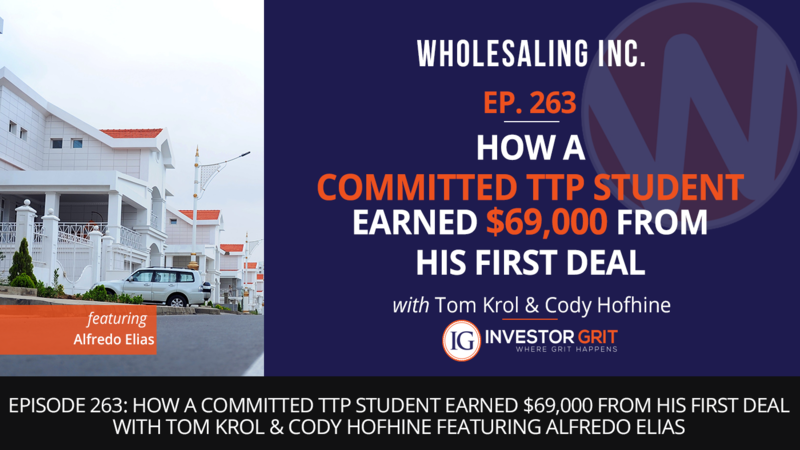 While he had certain assumptions about wholesaling (not to mention a chosen path in mind) when he first started, he made a 180 change after picking Brent’s brain. His dedication to learning, his willingness to fail his way forward, and Brent’s expert help and guidance has made a world of difference for him. If you are one of the many who would like to give wholesaling a try, Alfredo’s inspiring story will surely resonate with you. If anything, his wholesaling journey is a testament that as long as you are committed, you’ll surely succeed and even get paid handsomely for your service! Alfredo found his seller from the tax delinquent list. After talking to the homeowner, he was able to purchase the contract for $318,000. He listed the property for $397,000 and got 4 offers that are above the asking price. After all was said and done, he was able to earn a whopping $69,000 from the deal. Not bad for someone who only wholesales on the side!